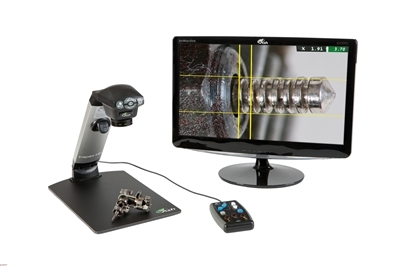 Accurate and detailed inspection of a wide variety of objects enabled by superb HD image resolution, dynamic range of magnification levels, and integrated LED illumination. Real time, on-screen measurement for quick and cost effective quality assurance provided by integrated on-screen XY dimensioning grids and cursor functions. Less operator fatigue and improved production efficiencies due to ergonomic design enabling user to sit or stand in a comfortable and safe posture. Easy documentation and traceability for accurate quality control records using image capture software. Aven 26700-102-15 Aven Micro Zoom Series 640 PK3 Benchtop Measurement System Aven 26700-103-10 Macro Series Zoom 7000 PK M2 Luxo WAL025970 Wave LED Rectangular Lens LED Magnifier Ash-Vision MR-801-420 Height Adjustable Table 8" x 8"